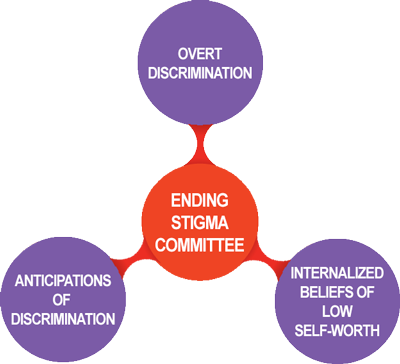 The Getting To Zero Ending Stigma Committee is dedicated to eliminating prejudice and discrimination against people living with HIV and the communities disproportionately impacted by the disease. Our work complements efforts by our sister committees to increase access to PrEP, promote rapid utilization of services after diagnosis, and ensure retention in care for those living with HIV. Ending stigma will eliminate a prominent, pervasive barrier to prevention and treatment, and thereby help to lessen health disparities that drive the epidemic in San Francisco and the US at large. Our work proceeds with the recognition that stigma manifests in multiple ways. Intervention efforts will differ depending on those manifestations. First, stigma may take the form of overt discrimination, leading to violence against those living with or at risk of HIV, preventing individuals from accessing services, and resulting in psychological and physical trauma. Eliminating this manifestation of stigma requires a focus on those who discriminate (or are at risk of discriminating), seeking to intervene on behaviors that knowingly and unknowingly harm people and communities affected by HIV. Second, stigma may take the form of anticipation of discrimination. Such thoughts are a natural defense mechanism for those who previously experienced violence or prejudice. But, for those living with or at risk of HIV, they can also lead to fear of testing, hesitancy to adopt prevention methods (condoms, PrEP), and unwillingness to seek care. Intervention involves equipping people with the skills and confidence to combat discrimination, and the ability to recognize when anticipation of discrimination is no longer warranted. Third, stigma may manifest as internalized beliefs of low self-worth. These thoughts occur when someone living with or at risk for HIV believes he or she deserves to be a target of stigma. Such thoughts produce depression and feelings of shame, making it harder for a person to take action to prevent or treat HIV. Appropriate intervention can take multiple forms, including media campaigns to remind the community at large of the value of those living with or at risk for HIV and supportive services for individuals battling particularly acute feelings of shame and low self-worth. Our committee began meeting in May 2015. In the coming months, we will identify a set of specific interventions to respond to the role of stigma in driving the San Francisco HIV epidemic. We will also define outcomes by which to measure success of these interventions.